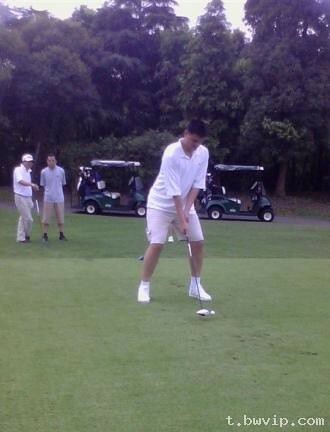 Raymond reports that Yao Ming told Sohu.com in an interview a couple of weeks ago that he would like to start playing the game of golf. Many people scoffed at the idea of Yao being able to play the game very well since he is so tall. Well, we have some proof that Yao is serious about it. Checkout the photo below taken at the Shanghai’s Sheshan International Golf Club over the last few days. Actually, the way he is addressing the ball looks pretty good for a starter. You can tell he’s getting some good instruction. Raymond also reports that Yao recently moved to a new house in the Song Shan District from his old Xuhui District. Sheshan (and the golf club) is in the Song Shan District and is known for its luxurious houses and villas, as well as its great view of the Huangpu River. This entry was posted on Wednesday, August 3rd, 2011 at 2:15 pm	and is filed under China. You can follow any responses to this entry through the RSS 2.0 feed. Any news about whether Yao is selling his Houston house? Will he still be maintaining any ties to the Rockets? No news about Yao selling his Houston house, but I think he made a statement where he will keep a presence there. Most of his time will be spent in China, so he probably won't be active with the Rockets much. Maybe an occasional appearance at Toyota Center like Hakeem does. In one of his public appearances, receiving an award for life time sports achievement from Shanghai Mayor Han Zheng, he told Han Zheng that after his retirement, he will spend most likely 9 ~ 10 months out of the year in Shanghai. So yeah, unless Leslie Alexnader offers him and he accepts a post in Houston Rockets, we probably will only see Yao Ming back into Houston once and for a while while he travels to USA for visits or business.